Last week TFP Student Action launched a protest petition urging DePaul University to stop offering "career opportunities" with the largest abortion network in the nation – Planned Parenthood. 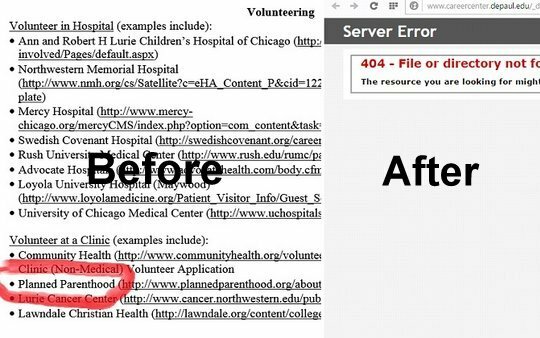 Hours after being launched, the petition garnered thousands of signatures and a swift reaction from DePaul: the Planned Parenthood volunteer "opportunity" was removed from the web page where it had been listed under "Volunteering, Shadowing, and Leadership Opportunities." Later in the day, pro-life supporters informed TFP Student Action that the second link to Planned Parenthood featured on the "Career Center" web page was also deleted. Several pro-life advocates took it upon themselves to place calls to the office of Fr. Dennis H. Holtschneider, president of DePaul University, to complain about the problematic relationship. “We've taken it down from the web site,” said a receptionist for the DePaul University career center shortly before hanging up the phone on a TFP volunteer who wanted to know how the university was planning to prevent future listings from going up again. “If you have any questions feel free to contact Planned Parenthood,” said the receptionist. In spite of the fast reaction of DePaul in taking down the information from their web site, the lack of any statement – public or private – on the part of the university does nothing to suggest the relationship has been completely severed. The responsibility of assuring the public that DePaul intends to be true to its Catholic identity is in the hands of Fr. Holtschneider and the administration.